Honeycrisp. Gala. Granny Smith. Fuji. Consumers can name numerous apple varieties, and almost everyone has their favorite. But not so for the banana. 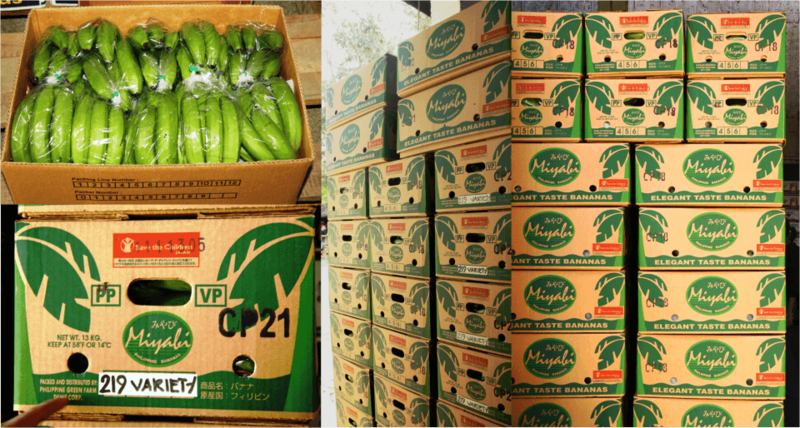 Chances are, unless you live in a tropical banana-growing region, you have only one choice at your local grocery store, and it’s the Cavendish, a variety that has dominated the global banana trade since the 1950s due to its transportability and long shelf life. The banana’s development into a major worldwide trade commodity has its roots in the eighteen hundreds, when merchants shipped plantains from the Caribbean to American and European markets. 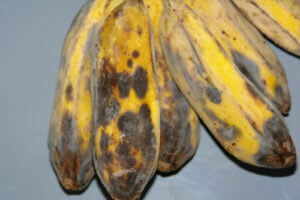 But the harvested plantains often bruised or spoiled during transport. That changed in 1829, when Englishman Charles Telfair shipped a couple of banana plants to an acquaintance in England, where they eventually passed into the hands of the 7th Duke of Devonshire, William Cavendish. 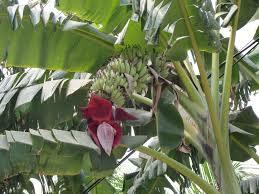 Cavendish was able to cultivate the plants, and the Cavendish banana was formally recognized as a cultivar in 1836. From England, the cultivar was subsequently diffused back into the tropical zones, including to islands of the South Pacific. By 1855, intensively managed crops of one kind of plantain, the Cavendish, spread from Tahiti into Hawaii, Australia, and Papua New Guinea. It came to dominate the world market. But the unprecedented success has come a catastrophic problem–the switch from polyculture to monoculture in banana plantations. 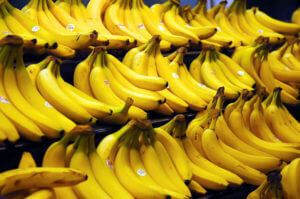 Acres and acres of banana crops were all genetically identical. 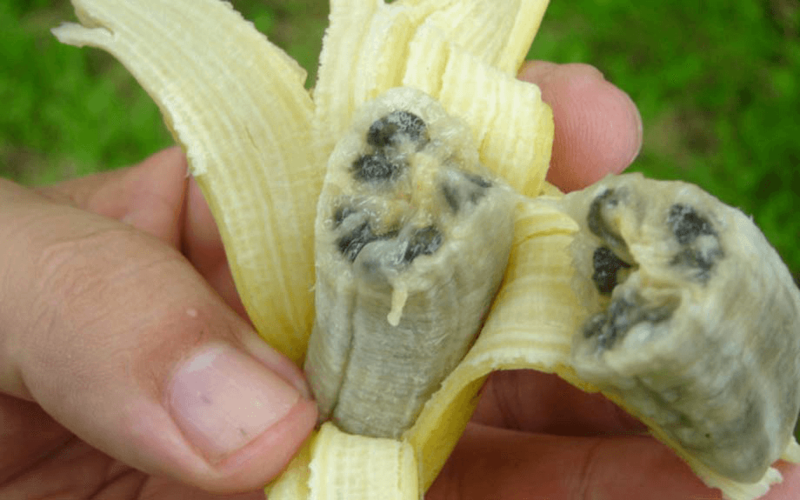 The over-reliance on only one variety in monoculture plantations left the banana susceptible to Fusarium oxysporum, colloquially known as “Panama Disease” or “fusarium wilt.” Caused by a soil fungus, it spread through banana plantations worldwide. By the 1930s, Panama disease had diffused to nearly all of the banana farms of the American tropics, and by the 1950s had annihilated the Gros Michel commercially. The fruit conglomerates had no choice but to abandon the varietal in favor of newer forms, and by 1958, the plantations turned to the Cavendish varietal, a smaller, less flavorful version of the Big Mike, but with a greater disease resistance. verge of commercial extinction. A strain of fusarium wilt, known as “Tropical Race Four,” is diffusing from Southeast Asia across the tropical band, spread by both anthropogenic and natural means. Although its spread has been slow moving, if it reaches Central America, which supplies 82 percent of the global banana supply, the industry could be ruined. The same saga is also playing out in the orange industry. Nearly all Florida orange juice is made with a blend from just two varieties: the Hamlin and the Valencia. Florida orange growers have been struggling with a disease called citrus greening since 2005. 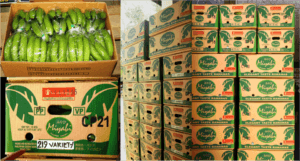 What can banana or Florida orange growers do? Sadly, there are no clear ways to successfully fight the diseases that threaten to overwhelm these monocultural crops. It turns out that genetic engineering appears to be the one tool that could speed a solution to the banana fungus and citrus greening. Monoculture — growing vast fields of the same crop year after year — is probably the single most powerful simplification of modern agriculture. But monoculture is poorly fitted to the way nature seems to work. Very simply, a field of identical plants will be exquisitely vulnerable to insects, weeds and disease. Monoculture is at the root of virtually every problem that bedevils the modern farmer, and that virtually every input has been designed to solve. Biotechnology is the new silver bullet that will save monoculture. But a new silver bullet is not a new paradigm — rather, it’s something that will allow the old paradigm to survive. Since Pollan wrote this in 1998, the undeniable problems posed by monocultures have put forward as an against GMOs. Let’s look a little closer. Is monoculture synonymous with GE crops? Because two of the most popular genetically engineered foods are commodity crops–corn and soybeans–many people think and activists like Michael Pollan promote the belief that GMOs and monoculture are identical. But few experts agree with this assessment, however. There is no necessary link between monoculture and GE crops–as the devastating problems with the banana and the Florida orange illustrate only too well. 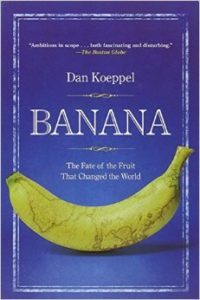 As far as the future of bananas, Dan Koeppel, author of Banana: The Fate of the Fruit That Changed the World, says the issue is complex and both GM technology and diversification are needed to rescue the fruit. Another skeptical activist group, GMO Inside, regularly plays the monoculture card. On its blog, it claims that GE crops lead almost automatically to monocultures, as farmers are incentivized to eliminate previously grown varieties to make way for fewer and fewer higher-yielding, more lucrative varieties. Reductions in crop genetic diversity have implications both over the short term and over the longer term. (2) Over the long term, increasing reliance on a relatively few varieties leads to the loss of well-adapted, genetically variable varieties through lack of use. Such losses are permanent. But that’s true of all commercial crops. There is no question we need industrial scale agriculture; it’s been one of the key drivers in the Green Revolution. The key is how to harness it. The driver of monoculture is economic and has little to do with the breeding process per se. Farmers are businessmen, and they often make choices based on what return they can get in the short term rather than taking a longer view. This includes the industrialization of the organic industry, which is becoming increasingly large scale. The monoculture problem is structural, and can happen whether farmers choose GMO, conventional or organic seeds. One common farming practice that can help with crops that need to be replanted annually (and is often ignored in arguments against monoculture) is crop rotation, in which farmers plant a variety of crops in rotation to break pest cycles and ensure soil health. Of course, this is virtually impossible when addressing the problems with perennial tree crops, such as oranges. Researchers at the Centre for Tropical Crops and Biocommodities at Queensland University of Technology in Brisbane, Australia, which are using Gates Foundation funding to develop a Ugandan banana fortified with Vitamin A, began field-testing the first Cavendish banana genetically modified to be resistant to the fungus on Borsato’s land in 2011. Progress has so far remained slow. In 2013, James Dale, director of the Centre for Tropical Crops and Biocommodities turned to the genes of a wild Asian banana found in India, scientifically known as the Musa acuminata malaccensis. Bioversity International, a branch of the global CGIAR research centers, has also conducted field trials on a resistant type of the Cavendish from Thailand and recently successfully marketed a related Philippine variety of the resistant Giant Cavendish in Japan, although researchers are not yet convinced that either can replace the commercially popular Cavendish grown around the world. Key players in the industry, Chiquita and Dole, remain focused on traditional breeding, skeptical that a genetically engineered banana could work for the global market. Either way, the problem of monoculture crops doesn’t go away. And there are plenty of cautionary tales to illustrate that GM solution or not, problems with monoculture shouldn’t be glossed over.